This 1-day program on June 22nd, 2019, in Ann Arbor, MI, is designed to be broadly applicable to any mentor or mentee experience; we encourage interested faculty, residents, and students to attend. Mentorship is the secret sauce of faculty and resident development. We know that those who receive effective mentorship experience stronger career trajectories and have higher levels of productivity. 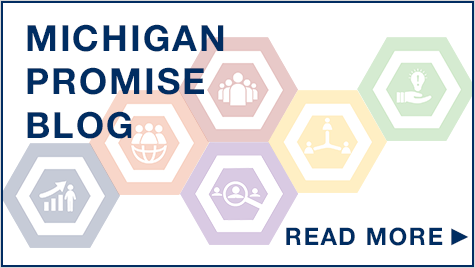 Because mentorship is so vital to career development and long-term success, the Department of Surgery has explicitly incorporated Mentorship Training into the Achievement arm of the Michigan Promise. Mentorship, broadly defined, is a professional relationship in which a more experienced person guides a less experienced person in professional or personal growth. But what exactly does that mean in the day to day life of an academic physician? What does that look like for each mentor/mentee dyad? How do mentors and mentees find each other and form effective relationships? How should dyads navigate bumps in the road? What does an effective mentor look like? What can a mentee do to get the most out of a mentoring experience? The Michigan Mentorship Academy will answer these questions and fulfill the Michigan Promise of providing excellence in mentorship training. 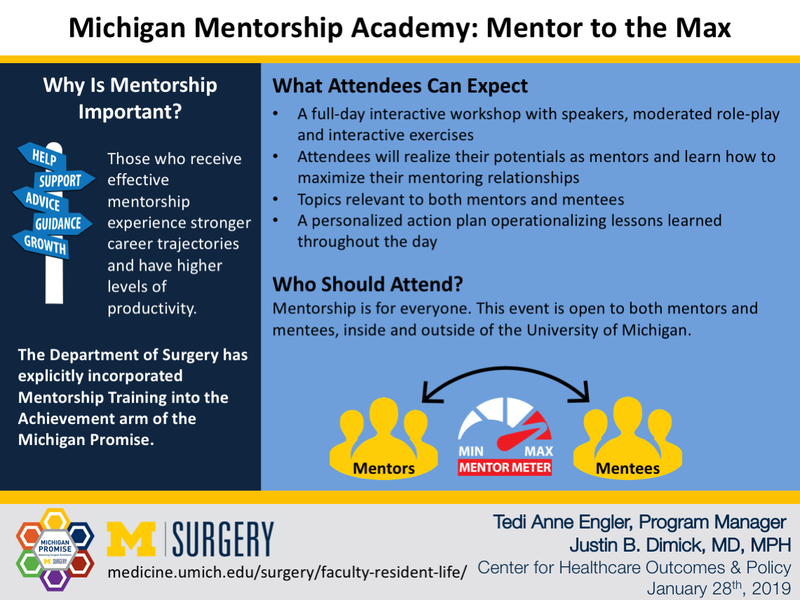 This 1-day program on June 22nd, 2019, in Ann Arbor, MI, is designed to be broadly applicable to any mentor or mentee experience; we encourage interested faculty, residents, and students to attend. For more information, visit michmed.org/e6ydn. Hosted by Justin Dimick (Department of Surgery), Vineet Chopra (Department of Internal Medicine) and Michelle Moniz (Department of Obstetrics and Gynecology), the Michigan Mentorship Academy is full-day interactive workshop with speakers, moderated role-play and interactive exercises to help attendees realize their potential as mentors and learn how to maximize their mentoring relationships. We believe that everyone is both a mentee and a mentor. As such, we will cover topics relevant to both groups throughout the day. With topics like “What Mentors Wish their Mentees Knew,” “Mentee Missteps” and “Picking the Right Mentor,” mentees will gain valuable skills enabling them to effectively manage their mentoring relationships. Mentors will learn how to extract each mentee’s unique “golden nugget” of talent. After all, the goal of mentorship is to help the mentee craft the trajectory they want for themselves. Finally, we will discuss how to build a culture that supports strong mentorship. We will bring the day full circle with break out groups for the attendees to crystalize what they’ve learned. Everyone will leave with a personalized action plan operationalizing the lessons learned throughout the day – their Mentorship Action Plan. Mentees will have identified their mentoring needs, what needs are already met, and have a plan for filling their mentorship gaps. Mentors will have identified their resources and made a plan for deploying those resources. We will conclude the day and take our Mentorship Action Plans to the next level by considering lessons from other disciplines with speakers from the auto, social media, and tech industries, and a keynote from Scott DeRue, the Edward J. Frey Dean of the Stephen M. Ross School of Business at the University of Michigan. How do other fields give and receive feedback? What can we learn from our colleagues across campus? Should we, could we and how do we mentor across disciplines? Mentorship is for everyone. This event is open to both mentors and mentees, inside and outside of the University of Michigan. Mentor/mentee dyads are welcome to attend together. Staff, administrators or looking to enhance the culture of mentorship at their institution should attend as well. Anyone involved in mentorship in any way will learn valuable lessons from this program. 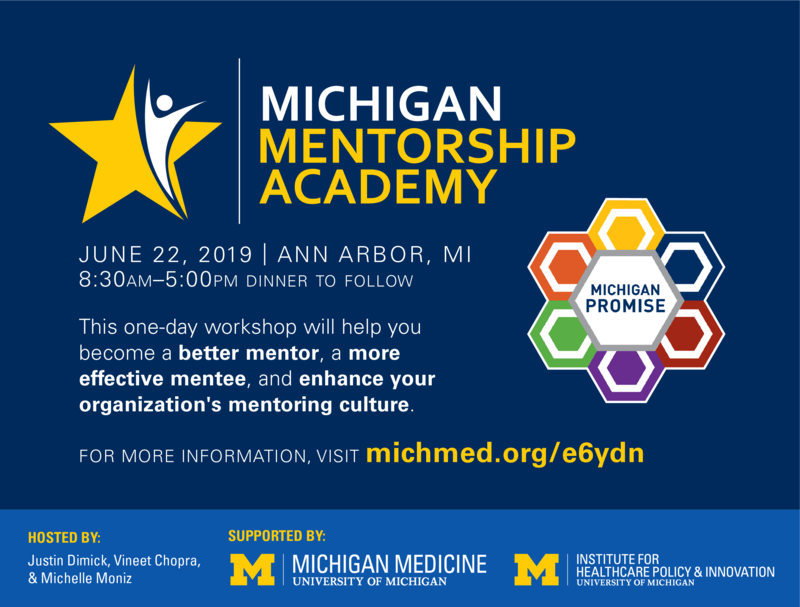 Michigan Mentorship Academy speakers to include: Sanjay Saint, Jennifer Waljee, Vineet Chopra, Vineet Arora, Valerie Vaughn, Justin Dimick, Dana Telem, and Michelle Moniz.  The University of Michigan has a strong track record of successful mentoring in academic medicine. 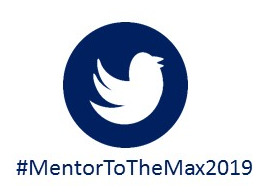 Through the Michigan Mentorship Academy we will share our strategies enabling others the mentor to the max. This event is generously sponsored by the Department of Surgery, the Department of Internal Medicine, Department of Obstetrics and Gynecology, the Institute for Healthcare Policy and Innovation, Patient Safety Enhancement Program, Center for Healthcare Outcomes and Policy, Office of Faculty Development, and the Michigan Institute for Clinical & Health Research.